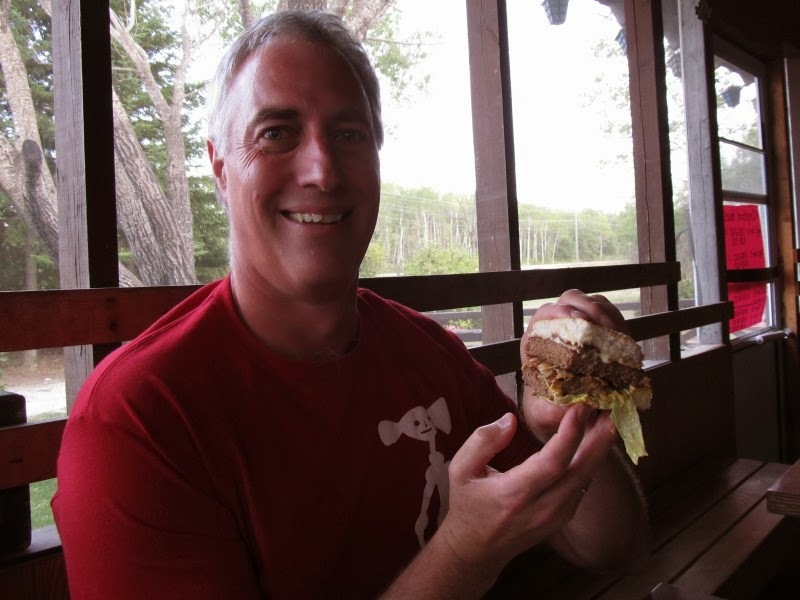 It’s March, the cold has snapped, and visions of summer burgers are dancing in my head! If you're heading to the Northstar Trail, Victoria Beach, or Powerview this summer, travel the less beaten path and let highway 12 lead you straight to the Sherwood Forest Chipstand. 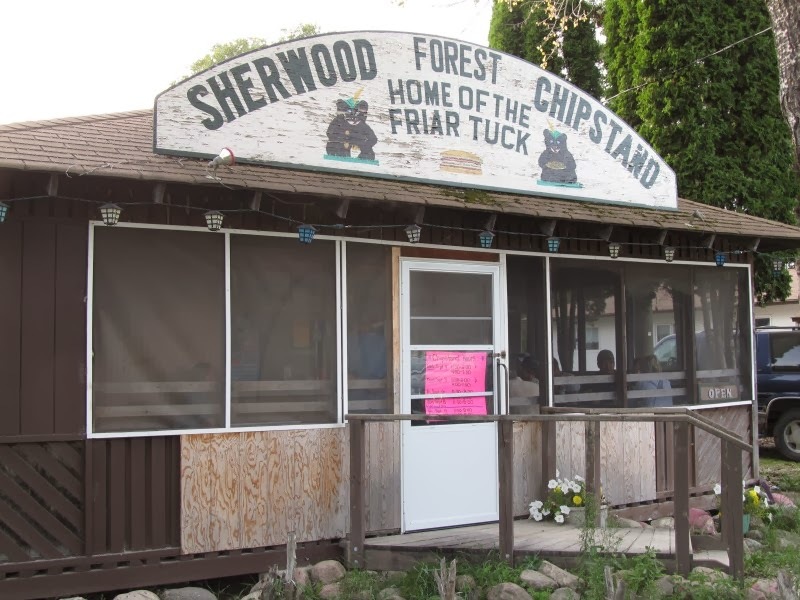 The home of the Friar Tuck burger is nestled in the trees at the corner of #12 and Stead Road near Gull Lake (50.400075, -96.491142). You can buy gas there - a good thing as gas stations are sparse in the area - and visit a wonderful little store offering all the essentials including treasures you'll only find in the country and fresh smoked sausage waiting on the counter. It’s a popular gas station with plenty of pickups, gravel trucks and ATVs coming and going. The Sherwood Forest Chipstand has its own little park complete with picnic tables, shaded by some big Cedar and Birch trees. If it’s raining, there's a screen room with plenty of spacious tables and benches. The Sherwood has a welcoming, country “at-home” feeling. Families go there for supper, teens go there to flirt with their dates, and the grownups have a party picnic table on the path between the Chipstand and the store. The only word of caution - the guest facilities are an outhouse, so if you’re not that much of a naturalist, plan ahead. They do a good business of take-away and catering, so depending how busy they are, you might get your burger quickly, or you might have some time to enjoy the scenery. When Karen and I visited it was full, people were ordering ice-cream sundaes, and they were cooking up mountains of food for a function that evening. It's window service - as burger stands are – and I was greeted by a smiling lady working the kitchen by herself. She took our orders and was quite happy to fry up some onions to go on my burger. Still, it didn't take long for my gigantic sandwich to be prepared – and I really enjoyed it. The burger was juicy, tasty and filling. 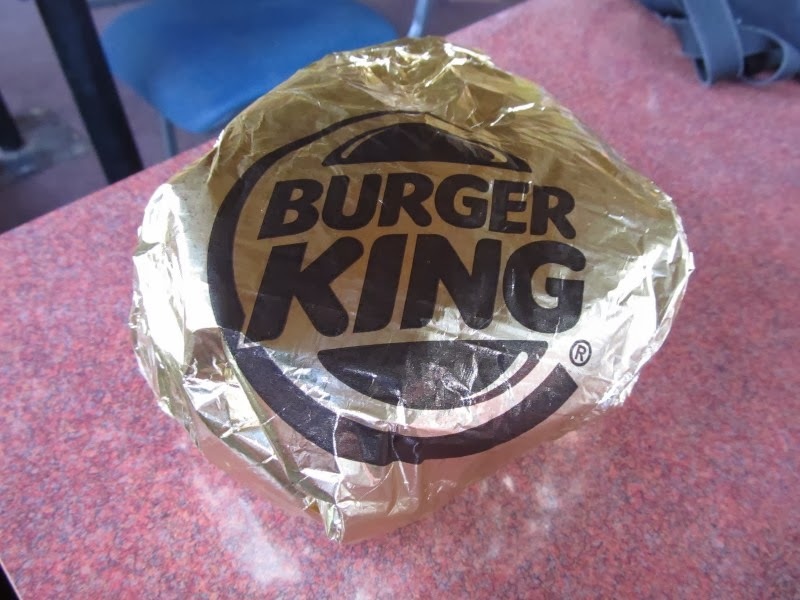 There were two big hot-off-the-grill, finely ground and fairly firm patties on my Friar Tuck. 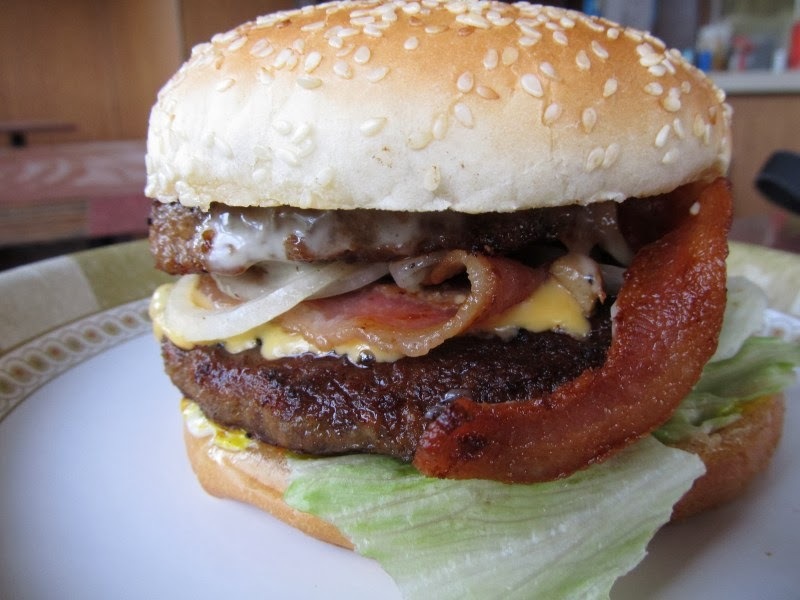 The fried onions, combined with the cheese and plentiful bacon, created a third layer of happiness. Condiments added just the right amount of messiness. The tall stack presented a challenge to keep my burger assembly from sliding apart, but I like a challenge. 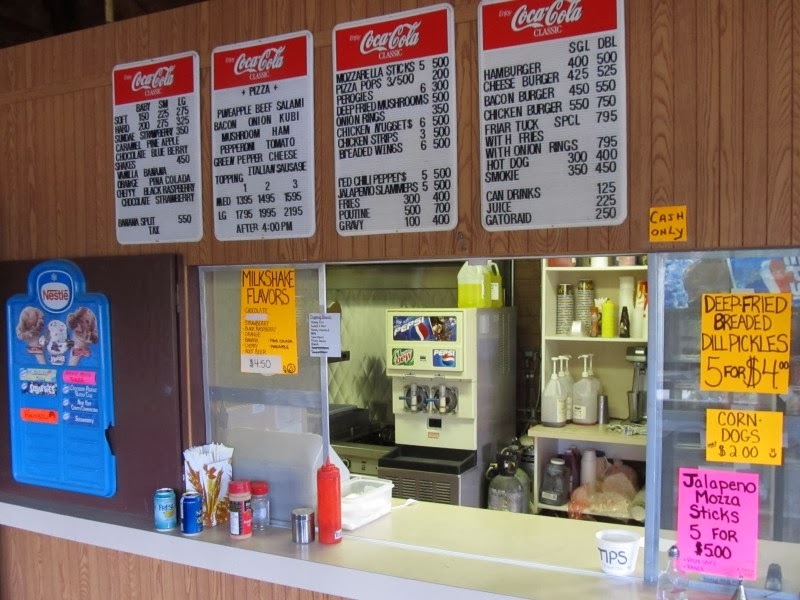 It’s quite inexpensive - the Friar Tuck with fries or onion rings is $7.95. 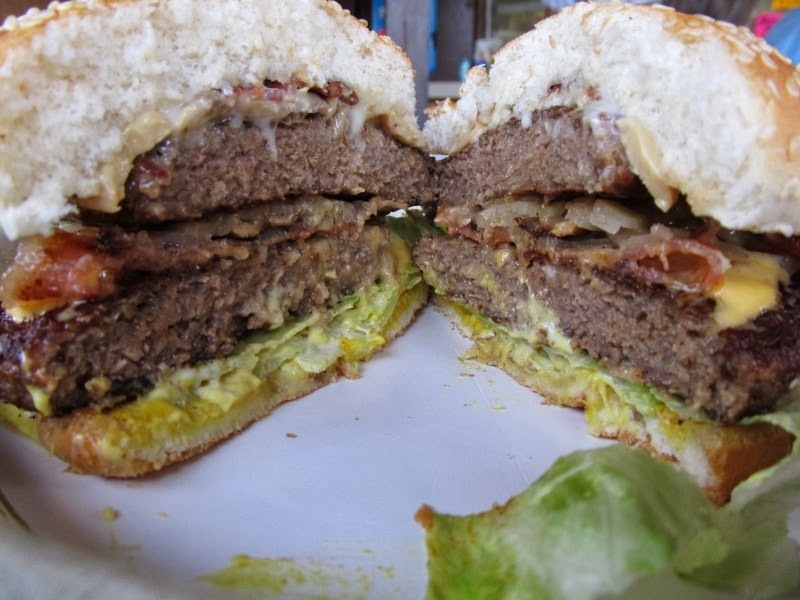 If for some inexplicable reason you don’t feel like a burger, they also make pizza, perogies, corn dogs, Jalapeno mozza sticks and deep fried breaded pickles! What more could you ask for? Sherwood is one of my favourite pit stops in that area. They have a tasty burger and the grocery store next door is kinda interesting to wander through.